We have been exploring new locations and discovering site gems for years. I remember diving in Dahab in 1999, and taking my first group there in 2001 – when The Blue Hole was strictly a 4×4 excursion, since then we seem to be bombarded with offers from further and further afield, promising a freediving experience like no other. Then, last year, a small sailing company, dedicated to delivering personal experiences contacted us: I was intrigued to see how much of a true expedition we could find just 3h away from London. We sailed from the island of Kefalonia, the biggest of the Ionian Islands, as a location I have explored a few times getting tanks for the sled was easy on a stopover in Fiscardo, before checking out “The Cracken” as well as “Seal the Deal”. Two amazing natural surface formations. The Cracken being an invisible (at least up-to 5m away) crack, which effectively separated a huge rock from the mainland – about 30m long and 3m deep. As it twists and turns, the crystal clear water is reminiscent of a ridiculously exotic film location. A simply stunning find for our 1st day! “OK – we’ll work out a way”: every dive location we could think of was available to us. From the awe-inspiring “Eye of Cyclops” – a huge cave with an entrance (the eye) in the top at 20m and an exit at 30m – to the “Pressure Chamber” a hidden iridescent blue cave filled with air that tests your equalizing by pressurizing every time a swell forces it way in. On the 3rd afternoon, when all equalization cobwebs had been blown away and the stress of London life was but a passing thought, we came to a secluded beach frequented by only a few ships in the winter as it offered sheltered anchoring and more importantly a makeshift barbecue pit on the beach. The water was insanely flat which allowed us to spot “A ladder which we should avoid tangling our anchor on”. Due to the water being gin clear, we could see that this “ladder” was a strange looking wreck that required further exploration. It turned out to be the wreck of a 40 – 45ft yacht, unmarked on charts or diving maps. The steel frame was in one piece, with the wooden shroud all but completely rotten away leaving an almost perfect freedive wreck sitting at 20 – 25m. After the morning rope session on a deserted island and a few excited dives on our new favorite wreck, we needed to find a port. After a night dreaming of wreck diving, we came back and as the yacht was expertly moored almost directly above “The Unnamed Wreck”, we set up the sled and started diving. We take our travel sled with us most places we go and have done since the early 2000’s when we invented it. A simple machine that uses the scuba tank as the mainstay, to which the weights and lift bag are connected with climbing slings. The secret of this is the way it falls, as in the tank “wants” to fall at an angle, which means – if you let it – it actually sinks perfectly straight not requiring the rope to guide it at all. Resulting in a freefall Guillaume Nery would be envious of. Almost immediately we found the sheltered bay had virtually zero current allowing unprecedented ability to arrive directly on the wreck every dive. Some of the guests were at their limit as we touched down but, of course, having had a free ride were able to stay and enjoy the awe-inspiring view for a few seconds before returning ‘a la’ sled. 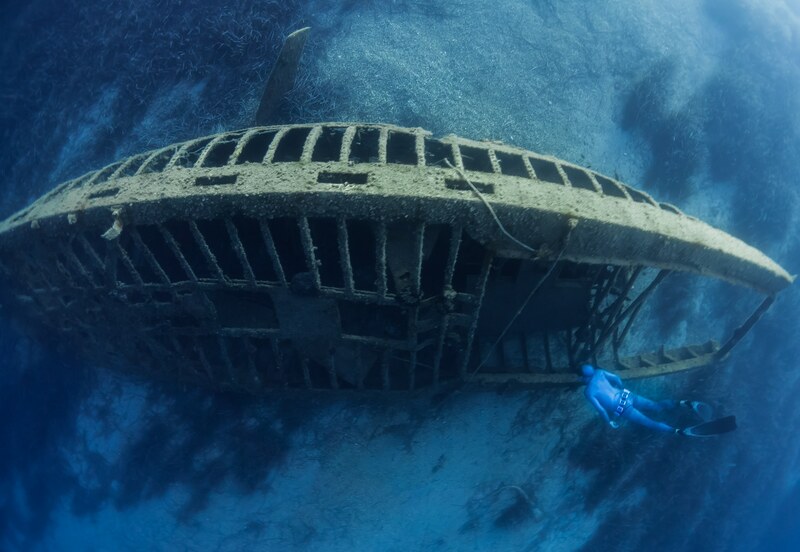 Marco (my assistant instructor) had recently discovered the joys of photography over spearfishing and was intrigued with the idea of photographing the wreck – while using the sled. A seemingly benign proposition considering he had descended to it at least 10 times during the session under his own propulsion, but the proposition of holding both the sled and the camera whilst equalizing was a step too far. The obvious solution – a camera caddy. Elias obligingly took the job of diving to the wreck with the camera, Mika drove the sled and Marco went along for the ride. SIMPLE. Well – simplish. As we needed 3 safety divers as well, the total of 6 divers that needed to be co-ordinated was a point of mirth – but ultimately successful. A demonstration that we can set our own targets, irrespective of what would be considered a difficult dive by other people. 2hours and 30 dives later we clambered back on board to a delightful veggie/vegan brunch that would make London restauranteurs jealous. The sled is a reasonably new invention, brought about by Jaques Mayol’s desire to maintain the world record. It’s forerunner, by several hundred years, was the skandolapetra. A tool used by Greek fishermen to harvest the ocean floor long before underwater breathing apparatus. A large stone was held by the diver, attached to a rope that was fed out (and hauled back in) by a partner onboard a boat. The EYSailing guys were very excited about the new skandolapetra they had on board, and we wanted to try this ancient Freediving system out. The principle is simple, jump overboard holding a heavy stone, get pulled back when you’re done. The reality is not quite as simple, especially if you are not able to use a noseclip to equalize as the Ancient Greeks were not. We were, however, able to test the new TiTAN titanium nose clip. After an hour of photo shoots, dives and dubious “pull me back” rope signals we were getting a bit cold and ready for a call into port for an evening on land. Finding depth is not a problem in the Ionian Islands, more often than not the shores drop off into deep iridescent blue, inviting rope sessions at every location. We resisted the temptation in favor of exploration most afternoons, leaving the AM dives open for rope sessions. This was not the only objective of the trip… a more sinister (some would say sinister, I would say “playful”) objective had been given to us. Mermaid photos. Merfolk would be a better description… either way we had to photograph them! I had some ideas beyond the basic “Merman on a rock” – which involved the interaction of Merfolk and Freedivers. instantly the complexity of these shots became a problem for us to play with and eventually solve. There’s not a lot more I can say – except: we did it. And had fun doing it. The final part of the trip involved accessing some caves we had previously explored on Kefalonia. We moored off the coast on the last day before returning to the airport, and jumped on the tender for the short trip to the beach to the bemusement of the locals… a group of freedivers coming off a boat – onshore – to dive? We opted to dive the easier of the caves and attempt to photograph our exploration in 360 panoramas. This required a little invention to float the camera exactly 1/2 way out of the water, to which a chip shop polystyrene tray came into its own! Not very technical, but very effective. 3 of us were returning – excited by the prospect of diving in the most amazing location I have ever dived, 3 of us were apprehensive about the prospect of pitch black cave with vertigo-inducing clear water. It did not disappoint. 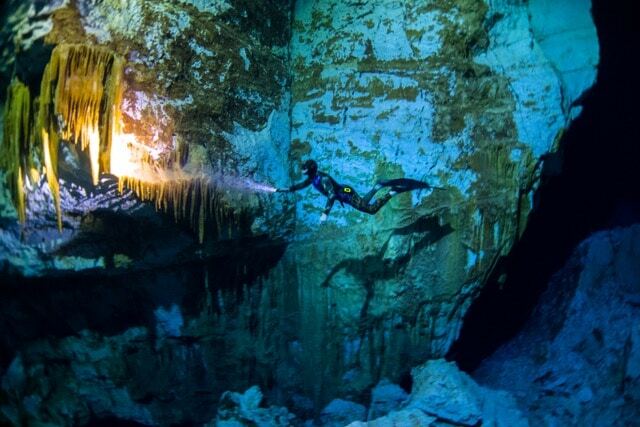 Awe-inspiring dive, with some photos actually getting close to capturing the assault on our senses. The entrance to the cave a bright blue, mesmerizing arch at one end… its light dwindling as we moved 10m from it, leaving us totally dependant on our torches (no ordinary torches I might add). The darkness always holds secrets and breathtaking expectations, especially when there are several chambers beyond your torchlight. Although the main chamber is 15m deep, it feels like you are always just 2m from the surface throughout each dive, you feel like you can reach out and touch the ceiling. From the surface looking down, your buddies seem to get smaller, without moving away from you… a very disconcerting experience. I have written about the caves of Kefalonia in the past, and filmed them, and photographed them – but they never lose their awesomeness. The pure feeling of freedom within the seemingly endless caverns is addictive and seductive. On this trip, the 3 newbies were (as expected) in sensory overload, unable to take in all the information resulting in dives where they failed to see the 10ft high stalactites just 5m from the surface. Returning divers always seem to have a calm acceptance of what they are experiencing, and a soft focus on what they want to do/see. This trip was not an exception. It was, however, exceptional. As we walked along the beach back to the tender we reminisced about the amazing trip we had just experienced. 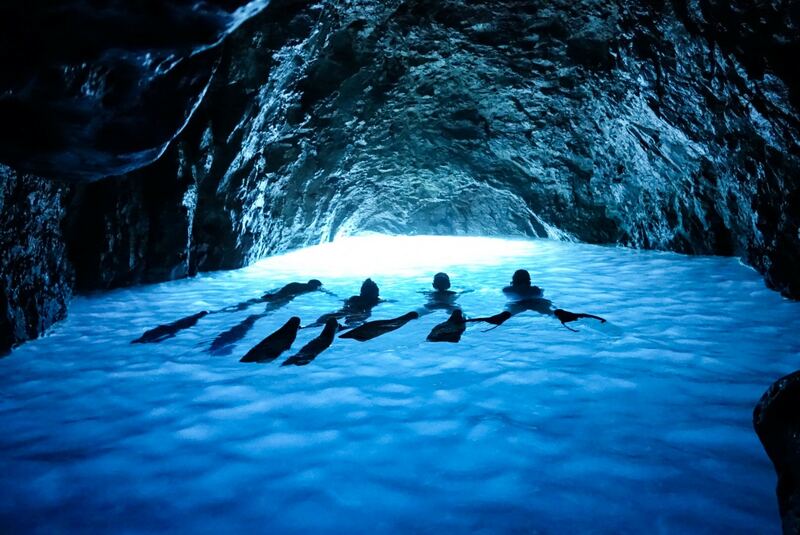 6 days of exploration, crystal clear water, caves, photography, sled diving, drone flying and good times – not forgetting Mermaids and Mermen. I was pleasantly surprised to find although it was a “small” yacht with only 8 beds, how the set-up maximized space, and we never felt cramped. The showers in the 2 “heads” (ships loos) were awkward but with a hot fresh water shower on the rear of the boat, these hardly seemed necessary. I can’t speak highly enough of the crew, Elias (Skipper) was insanely knowledgeable and helpful beyond any expectations, Panos (host) became so in tune with our requirements the merest thought of tea or light lunch was enough to bring it into existence. The presence of a vegan, a veggie and recovering caffeine addict was not the slightest problem with them. They have a standard Freedive Bouy onboard, with enough rope to dive deep. Of course, they stipulate that the depths they offer a group depend entirely on skill levels and qualifications. Oxygen is available on the islands, but again is the responsibility of the group.